Replaces the C14, which was getting...heavy. PeteN95, FeralRdr and Rusty Nail like this. Wear a blue and black jacket, white and black helmet and pucker a few assholes as you cruise down the highway. People are going to behave around a black and white bike. My Concours got heavy a year ago. Miss it, but she is a heavy girl! Noice! Yea, the C-14 is heavy but mine serves as my workout plan! But I do have a 420 LB wet ZX-10 in the stable as well. Black and whites freak me out. I planned on a ride today after lunch if you want to go give it a shakedown. I have a Ninja 1000. Similar bike. Get busy on those Mods! Gonna do that after work today. Thought you previously had one of those? I see you reached the same realization as I did. The Conny is a good bike but it kind of purpose built and it isn't for fun jaunts. Congrats! That looks like a frolicsome machine. Yeah. I had one a few years ago. GREAT bike. THIs one's a bit more "used" but I'm freshening it up. Nice! 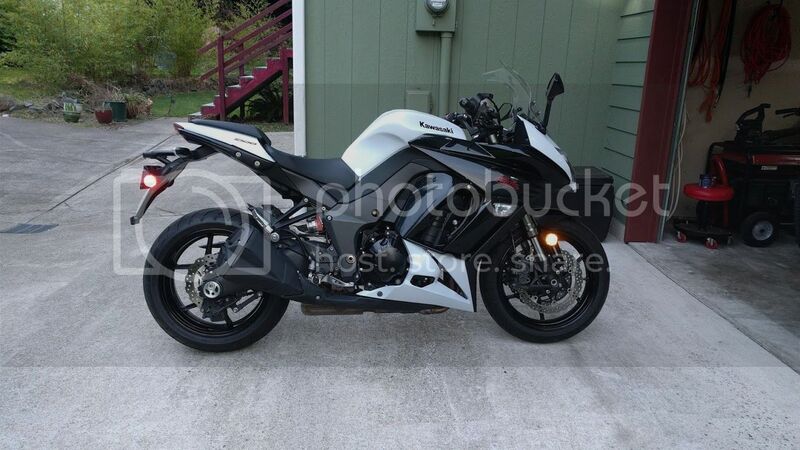 I did a similar downsize a few years ago from an FJR1300 to the '14 Ninja 1K. What the engine lacks in character it makes up for in smooth power delivery, though many swear by the Ivan tune: Ivan's Performance Products (Plus if you do that you can drop those really heavy stock cans). If that rear tire isn't already a 55 series, then moving from a 50 to a 55 on your next change will help speed up turn-in nicely (though here again, many also say you need to additionally raise the forks in the trees to get it proper flickable)...the 55 rear was enough for me. My biggest issue has been the vague and soft front suspension (though I'm a fatty and it may not be as bad for lighter riders). The suspension is fine until I started to push it and then was miserable at the track regardless of how much preload I put in it. I took it to EDR for heavier springs in the front, but they talked me into a GPSuspension valve kit instead to make the hydraulic damping actually worthwhile. We'll see how much that improves things this year. I go maybe 190 in full gear. I like it comfortable for the street, and will not track the bike ever. Also, my knee-dragging days are a few years back, and so comfier is moar better. That said, the difference between the bikes is ... stark. that C14 engine is a beautiful thing. Smooth as oiled glass. The N1K is more ... motorcycle-y. And, yeah, the 50 on the rear makes all the big Kaws handle heavy. Every review notes it, and my own experience on several of them agrees. BUt the tires on there now have like 100 miles, Road Smart 3's, and so it will be next season when I change them out and I'll go to a 55 Angel. Just got back from GH. I have done the math, accurate to 3 decimal places, and I have scientifically determined, objectively and irrefutably, that Kawasaki makes the funnest bikes. Rusty Nail and JayFree like this.